A couple of weeks ago we discussed the fact that meal planning is an important part of sticking to a budget. Not only does meal-planning help you stay on track financially, but I personally think it helps keep things interesting as well. If I actually dedicate a little time to planning out our dinners for the upcoming week there’s a much better chance we’ll have something to look forward to. I know a lot of you out there are expert meal planners (military style!) so please share any tips I left out in the comments below. Scour your fridge, pantry, & freezer so you can make note of ingredients you have on hand that should be used before they spoil. Also, make note of any staples you could incorporate as well (like rice or beans) to reduce your overall grocery purchases. Ask your local farmers market if they have an email list or newsletter so you can be notified of what they expect to offer at the next market. If not, figure out what will be in-season so you can plan meals around those items before you go. Check out your favorite supermarket’s weekly sales ad to see if there’s anything interesting you could incorporate in your meal plan. Sit down and spend at least 15 minutes planning out your dinners and grocery list for the week ahead based on the food you have on hand, (potential) farmers’ market finds, and grocery store sales. Pick out one brand new recipe to try each week to keep things interesting! Be adventurous and go for at least one meal a week you’ve never made before. If you have kids get them involved in helping you think of meal ideas for the upcoming week. Pull out some cookbooks, sit down together, and ask for their input. My 6-year-old doesn’t even know it yet, but she is best at motivating me to try those recipes I would have never normally picked on my own! In-between your weekly meal planning sessions always be on the lookout for inspiring recipes and meal ideas. Keep those recipes handy in a file folder or other reliable spot so you can reference them easily for inspiration. Only plan to make 4 to 5 different dinners each week – one of which is a new recipe. You can have leftovers, scrounge (breakfast for dinner anyone? ), or be spontaneous on the other nights. Most importantly…be flexible. If something unexpected comes up one evening (like laziness!) just move the planned dinner to the next night. Reminder: If you really aren’t into meal planning no matter how hard you try, then let our sponsor, The Fresh 20, do it for you! Previous Post: « Giveaway: $150 to Juice Beauty! WOW! 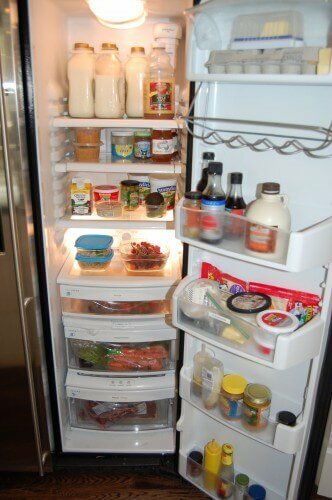 Look at that fridge. That is a thing of true beauty. Wish mine were half that organized! Try to work with a loose “schedule” each week so you know what type of food to plan for each night — for example, one night is pasta night, one night is sandwich night, one is Italian, one is Asian…whatever your family’s preferences are. It helps to instill both variety and routine, which is a must in meal planning! As far as seasonal things and farmer’s market (or CSA) finds go, one thing to cultivate is a sense of confidence and flexibility in cooking so that you can plan the basic meal, but use the ingredients you find. For example, just because pot roast usually has carrots and potatoes in your house doesn’t mean that you HAVE to use carrots and potatoes. If your farmer’s market or CSA gives you other root vegetables, like parsnips, celeriac, sweet potatoes, etc., you can still make pot roast. In other words, you don’t have to know EXACTLY which vegetables and fruits will be in season. You just have to know when the best time for greens is vs. the best time for winter veg. vs. the best time for berries. I plan a month at a time, which I find very freeing, and it makes the sale shopping even easier; I buy things when they’re on sale and put them in my freezer. Then I use them when a meal comes up on the rotation that requires those ingredients; or I make a note to use the ground lamb I got ridiculously cheap in the next month’s meals. How funny…hopefully it is not as scarring in this family! LisaJ – I can totally relate. We had one day a week where we flipped open the cookbook and had to choose something on the page. Thankfully that didn’t last long. I keep a running list on new recipes I want to try taped to the calendar. When I am planing meals for the week so I refer to it and remember what we wanted to try. I have been trying to get into the habit of having routines as well, mexican on Monday, asian on Tuesday, Soup on Wednesday, etc. Great ideas! I recently guest posted about this myself on Eating Made Easy. One thing that I find VERY helpful is to have my weekly meal list posted on the fridge: (1) it helps me remember each morning (and means I can do one last check to make sure we have everything we need) and (2) makes sure that the whole family is aware of the plan. Then I can easily ask for help too! Thanks for these great tips…and your wonderful blog. I don’t know about you, but I feel very fortunate to live in NC, where there is such a vibrant (fresh, local, organic) food community! Ours is actually a GE Monogram fridge…I would imagine they must be similar though! Hello Lisa, Love your blog! Not sure if you remember me but we met at Poplar Ridge Farm when you were stocking up before vacation.I am still participating in the work share program and loving all the fresh veggies. I have been recommending your blog to family, friends and anyone who will listen :) Just published a post on my blog recommending 100 days of real food and will post on FB as well. Just cast my vote for your blog! Voted! All the best to you! Great post! I am going to try out The Fresh 20. Also, I just voted. Good luck to you. You’ve got my vote, Lisa! For a while, I was stuck in a meal-planning rut. My solution? I made up a “brainstorm” list of all the main dishes my family enjoys. (Right now I’m up to 65 entrees!) I categorized it by fish, chicken, pork, vegetarian, beef, pasta, etc. Now when I’m in need of meal ideas, I just refer to my trusty list to see what I haven’t served in awhile. Making a good store list can take a while, but having one saves me time and $ in the long run. One major rule we have about grocery shopping, is NEVER go grocery shopping if you are hungry. Its too easy to stray from your list. When I make out my grocery list, I mark next to each item, an approximate price, I only have X-amount of dollars in my pocket each time we shop. I usually averaged $55 a week for our family of 5,that included laundry/paper products as well. We grow a large garden, I can and freeze as much as possible. What we don’t grow we purchase from nearby Amish. It is just my husband and I now. By always cooking from scratch one is able to stretch your budget, your imagination and it gives you more variety. I have always had a 1 to 10 rating on anything new I tried. If it didn’t rate at least a 5 I didn’t make it again. Also on the back of my grocery list I jot down menu ideas after scanning what is in the fridge or on the pantry shelves. We only go to the grocery store every 2 weeks. I love the idea of rating your own recipes! Not sure if this is the place to post menu ideas for our week? All wonderful ideas & input! I took a day and created an index for my family’s most used recipes. It’s a chart with ingredients listed up top & recipe names listed down the left side. So now when I get Sweet Potatoes in my CSA box I check my chart for all recipes including sweet potatoes. We “audition” a lot of new recipes too. I always try the recipe once and then decide wether or not to add it to my recipe index. Thanks for all your fabulous blog posts! They are a big source of inspiration for me! i try to keep my meal planning as simple as possible since it is a necessary task but one that i really dislike. i too stick to “theme nights” – mexican, pasta, meatless, leftovers, breakfast for dinner and so on. friday night is always homemade pizza night. this makes it so much easier to plan my menus. also, i keep breakfasts and lunches very simple and uniform. breakfast is usually eggs with homemade granola (& raw milk) or oatmeal. lunch is usually sandwiches on homemade bread and plenty of fruits and veggies. keeping those 2 meals simple makes my menu planning and shopping much easier. i have also found that having whole foods actually makes my menu planning easier since i always have plenty of fruits and veggies on hand and can easily add a simple bean dish or meat that i have on hand and call it dinner. Oh my goodness… exactly what I would have said! Such great info! I’m thinking of cutting processed foods this coming new year. Do you have any advice for me? Thanks again for the great info! What a great post – wonderful tips. I am a firm believer in meal planning – you save money, time and you’ll eat better for sure! In fact, I enjoy it so much I added a meal planning session to my health coaching business where I’ll teach my clients how to plan their own menus – perfect for those who don’t want to sit down and figure out how to do it on their own. I’ve found some people just like a little hand holding! I have recently been intrigued by reading blogs for craft tips, recipes, small diy ideas and came across yours. I have to say I LOVE LOVE LOVE IT!!!!! Your lunch ideas are the best because I have been in that sandwich,fruit,snack and drink rut, and your blog has given me healthier, more fun alternatives for my girls! Thank you and keep up the great work! Just discovered your blog and am a huge fan! I aspire to consistently meal plan, especially since I have two small children and my husband has Celiacs Disease so eating out can be expensive and/or stressful. I’ve tried many different “systems” like binders, cute printables, menu planning websites, etc but I’m not the most organized person in the world and have never been able to be consistently successful until I started using Yumprint.com. At first it just looks like a place to discover new recipes using my social network (which is great), but my favorite part is that I can click and drag my recipes onto my menu and then in one click create my shopping list to print or send to my phone. Love that! Ali, CSA: Community Support Agriculture. Typically, you pay a participating farmer an upfront fee, then each week, you pick up a specified amount of produce that he or she has grown. It’s a great way to get local, often organic produce, as long as you can afford the up-front amount! Google search CSAs for your area and see what’s available! Love your post, thanks for all the great ideas and meal planning that’s the hardest thing for me. I write my meals on post-it notes that fit well in the boxes of my family ‘s calendar. I can easily move the meal to another day this way, and I often go back to previous months and peel off the post-it and put it on an upcoming day. This saves me lots of time. Thanks for the post, 100 Days! The post its are a great idea for the calendar! I made myself an Excel spreadsheet on my home laptop a while back to ensure I incorporate vegetables and fruit into every supper. I plug the different elements of each meal – protein, carb, vegetables, good fat, dairy and fruit into the slots to ensure I have them all, even if it’s a one-dish meal. But it also helps to ensure I use different proteins, grains and vegetables throughout the week. Plus, it’s easy to move things around if something pops up (like laziness) and even to carry over a planned meal to then next week. I found plantoeat.com through your blog over a year ago and it has been a godsend for both meal planning and developing my weekly shopping list! For me the most important part of planning a menu is the calendar. I need to know if one day of the week I will be out all day driving for a field trip, we will have music lessons in the evening and my husband has a night meeting and needs to be back in the office promptly at 7:00. That’s not the day to try a complicated new recipe.